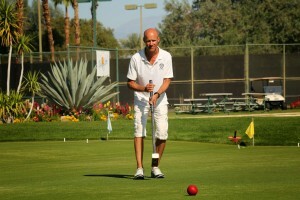 Daniel Pailas joined the Denver Croquet Club in August of 2012. He, like most, played backyard croquet as a kid. Daniel had noticed the lawn in Washington Park before, but it wasn't until an acquaintance mentioned being coaxed by club members into play on a Monday night, that Daniel ventured over to the lawn. Since that night he has suffered a condition that he terms C.O.S. (Croquet Obsession Syndrome). Rather than own a pet, he owns a mallet by the name of "Beast". Daniel began competitive training in January 2013, averaging about 20 hours a week in winter conditions on the Denver lawn. He gained much knowledge from all the club members (especially Charles Berberich and Paul Billings), for which he is grateful. In March 2013, Daniel attended the National AC Croquet Championship Tournament in Palm Springs, CA and that was the first of many competitions around the country (and sometime Canada) each year. After many hours of practice and the resultant rapid ascent up to championship ranking inside of his first year of competition, Daniel was honored to receive the U.S.C.A. 's Rookie of the Year award in 2014! Recently, Daniel is proud to have taken 3rd place in the US Open, and 2nd place in the Desert Classic, winning matches against many players ranked high above him and with far more experience. Of particular note is his defeating the Canadian National Champion twice at the Desert Classic and thus making it into the finals. These wins jettisoned his ranking to 34th in the USA with a grade of 1880. In the winter of 2015-16, Daniel spent most of his time living away from his home, staying in a cheap hotel room near the national Croquet Center in West Palm Beach,FL training for his short term goal of making it into the ultimate tournament this April: the World Championship. The qualifier tourney will be very difficult. He says if he plays better than he ever has, he has a small chance of making it into the Worlds. What advice do you have for new players? The sport can be enjoyed on so many different levels. I encourage everyone to simply love this game in whatever capacity they are drawn to. For those wanting to develop their game, and hopefully progress into one of the two advanced games (American rules or Association Rules), I think the same applies. Love of the craft is what drives me, and I have an appreciation of the incremental nature of learning this multi-layered sport; a sport I can enjoy well into old age and still keep learning. I'd suggest the same for aspiring players. It's good to keep things in perspective. The sport is a feedback loop -- we get pretty much what we put into it. Like playing a musical instrument, it's quite enjoyable to strum a few chords, but if and when you want to play at a performance level, the dedication and discipline needed increases considerably. Of course, the level of reward received personally from attaining proficiency one hopes is worth the time. But again, if love is the driving force, then one can't lose. Which tournaments have been the most exciting for you? Definitely the most recent ones; The US Open and the Desert Classic. This is due to finally feeling like I could execute with a small enough margin of error allowing me to beat top players while at the same time not be so frustrated with my own shortcomings physically and strategically. What has been the most challenging component in your experience with croquet? Well, initially, probably the strategic, mental side of the game was difficult for me. Like the game of chess, there are so many fascinating layers to examine and discover, and poor choices will cost you dearly in competition. The fact that games are timed and expeditious play is expected adds to the pressure. It felt like a lot to take in. Especially in combination with the physical demands. But grasping the game starts to snowball and that all becomes easier and easier. Of course, everyone learns in their own unique way, and I suppose I am not necessarily the quickest study. The Saintly Charles Berberich can tell you about that, lol. The fantastic thing about croquet is that you can always learn more and always get better. But in truth, you can also simply put in a little time and really enjoy the game. Or conversely, you can really dive in deep (or in my case, off the deep end), and then the game challenges you as much as you care to take on honestly. From a physical perspective, my biggest challenge was and will likely continue to be " hitting in" which involves send a ball 15-25 yards or more across the lawn to hopefully hit another ball and gain control of the lawn. How have the other players reacted to you as an up and coming player? Well, I guess an elite player who spoke with me recently probably gave me the most uncensored insiders commentary. He said to me: "First they ignored you, then they laughed at you, then they fought you, and then you win"! What's cool about this sport is that one's ranking is a pretty solid reflection of performance. And while there have been some who have complained about my tempo, especially in the past, many are realizing that perhaps I'm onto something in the way of precision and mindfulness. Now essentially I've been informed that the elite players are most fearful of me, as my ranking is still way below theirs. What that means is if I beat them, they will take a big hit in their ranking, and now they know I can in fact beat them if I'm playing at my best. This dynamic has brought a change in my rapport with the Championship players, whom all seem to be really admiring my commitment and dedication. Some have acknowledged to me that they certainly hadn't accomplished what I have inside of 2 years. Now it feels fantastic to feel embraced and mentored by the sports elite players. I've caught their attention and that feels great! They're virtually all awesome humans, and it feels like they are increasingly proud of me. How has croquet impacted your life and why do you like the sport? Well, as you know I suffer severely from C.O.S. (Croquet Obsession Syndrome), lol. I'm blessed to have the time to pursue this incredible sport relentlessly. I am so grateful for this sport, and all the fine people I meet and know, both here at the Denver Croquet Club and in the broader national community as well. I am so thankful for any vehicle in life that facilitates the expression of love and passion. Croquet is front and center in that regard for me currently! Wonderful to know the club and the green are still alive and well. I was greens chairman in 1988,89, and 90. Ed Merrell was Pres. We had some terrible weather. The green really suffered, but the club pulled together and saved it. I now live In Shanghai , China.